Please read the attached letter written on behalf of EEWG. Fortunately, there have been a substantial number of local objections to the proposed change of use so the application will be determined by the development committee. 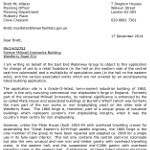 The EEWG letter may well be the first to raise conservation issues and as it will only count as one objection, many more similar letters are needed as soon as possible. The same letter could be sent so long as you make the necessary alterations and put your full address at the top. Please read the attached letter written on behalf of EEWG. 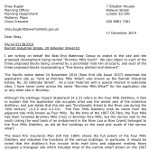 Fortunately, this is a very recent application (on behalf of Peabody) so your letter could be postponed to the New Year. Even so, it is urgently needed either to achieve amendments to what has already been approved by officers or make sure that the application is determined by the development committee (at least 20 actual letters signed by Tower Hamlets residents are needed).